Blackberries. Releasing themselves on the vine. This ‘going deeper’ is often misunderstood. One might think of that more as listening deeper. Being prepared to listen to what’s actually there, only more carefully. Then following with tender attention to detail. With expectations and outcomes, releasing. Work for you? My whole system is booting down after all of the activity over the past weeks. The weather has put a crimp in my walking activities ‘though I am still getting out, but just locally. No striding across distant green hills. Partly taken from an email to a friend who is having physical difficulties. A thought 4 u here. Front of postcard: The San Juan Islands at sunset. Remembrance of things fast. The Guardian On-line, 2001. Hi! Just sitting here by the gas fire late in the evening. Relaxing. I know I have some important emails to write, emails to answer that are days old. I hope people understand why I’m a bit behind. What I said back then about being sick with the possibilities was a positive by the way. I think you know that, right? It’s madness now to think I actually had to ask you and Dave to write a report making a case for me being on email. And now look at us, pushing messages and reports back and forth at the speed of light! 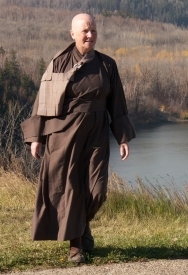 As you well know I was the first monk to officially have an email address. All due to your encouragement and Dave’s hand-me-on laptop. I was both proud and scared to be the first. Those early days traveling, hooking up to peoples phone lines and constantly changing my smtp settings. Now we catch a connection out of thin air! Goodness, and I stuck with my original compuserve address for TEN YEARS. Did I ever tell you that my very first email was a phishing one? Jane was beside me when it came in and was so ashamed, she was involved in the engineering of the Internet. They all had high aspirations for the Internet and were saddened by it’s miss use.